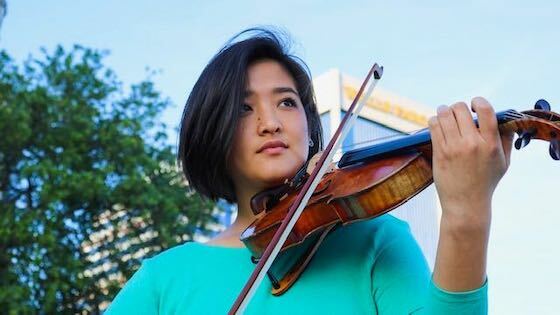 April 9, 2019, 12:34 PM · The Los Angeles Philharmonic Association announced Monday that violinist Gabriela Peña-Kim has been selected as a fellow in the new LA Phil Resident Fellowship program. The program was launched at the beginning of the 2018-2019 season as part of the orchestra's Centennial. It is a training program to help prepare musicians from historically underrepresented populations to compete for, and win, positions in major professional orchestras. The program is open to string players (violin, viola, cello, bass) or percussionists who have earned a bachelor’s degree and are from or serve underrepresented populations. Fellows are selected through a screening and audition process led by musicians of the Los Angeles Philharmonic and LA Phil Music & Artistic Director Gustavo Dudamel. A cohort of up to five Resident Fellows are appointed as musicians playing with the Los Angeles Philharmonic for up to three years. The Resident Fellows focus on their artistic development through orchestral, chamber music, new music, and education concerts at Walt Disney Concert Hall, the Hollywood Bowl, and in community settings. They also have the opportunity to participate in tours with the LA Phil and to receive mentorship and audition preparation assistance from LA Phil musicians. The LA Phil's first four Resident Fellows were selected in May 2018. They included violist Andrew François; bassist Michael Fuller; violinist Eduardo Rios and percussionist Wesley Sumpter. They began their fellowships in September 2018 and since that time François has won a position with the St. Louis Symphony. Applications for a Resident Fellow Viola position are currently open, and auditions will take place in July 2019. Peña-Kim is a graduate of the Jacobs School of Music at Indiana University, where she studied with Alexander Kerr. Her focus has been on orchestral playing, attending the Music Academy of the West, Pacific Music Festival, Schleswig-Holstein Musik Festival, and the Aspen Music Festival and also playing for the last two years in the Jacksonville Symphony. Her parents are the founders of the St. Augustine Music Festival, in which she has participated as a performer and also helped in managing. Her father is a native of Honduras and her mother is from South Korea. April 10, 2019 at 01:08 AM · Maybe she should be the one to "play with Ray"